In a medium bowl, whisk together cornmeal, sugar and salt. Pour in boiling water and mix until you form a paste. In a cast-iron skillet or on a griddle, melt 1 tbsp butter. Spoon tablespoonfuls of the batter onto the skillet, spreading them out to about a 2-inch diameter. Cook on each side until golden brown, about 4-6 minutes. Make sure you have a generous layer of butter on the bottom of the skillet or griddle when making these so they soak up the flavor. Serve warm with syrup or your favorite pancake toppings. The origin of the Johnny Cake (or, Jonnycake, journey cake, Johnny bread) is debatable. Some say the first batch was made by Native Americans, who used ground corn in a lot of their foods. Others say Johnny Cakes first emerged in New England. In any case, they are a delicious invention! 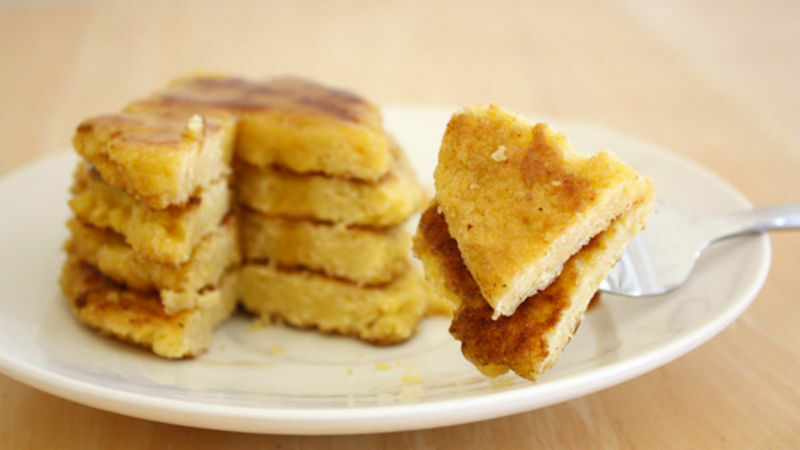 Johnny Cakes are a lot like pancakes, only they’re made with cornmeal. Like zucchini bread or banana bread, it seems everyone has their own way of making these yummy cakes. Me? I like to keep my version of the recipe simple, easy to make, and of course, tasty. Like cornbread in pancake form, these Johnny Cakes derive most of their flavor from the butter in which they’re cooked – so make sure you have a generous foundation of butter in the bottom of your skillet or griddle while making these. Otherwise, they might turn out a little dry and, well – boring. Another note for success: The “feel” of the batter is key. As a general rule, add only enough milk (or more water, if you prefer dairy-free) to get a consistency like thinned mashed potatoes. If you keep that in mind, these little silver dollar-sized cakes will turn out perfect each time. Feel free to follow this recipe to a T, or mix it up a little – add some flaxseeds for extra nutrition, or chipotle seasoning for a little kick. Top your Johnny Cakes with syrup, blueberries, and – dare I say it – even more butter!